To white out is to erase, to remove and go over as if what was, was never there. I am beginning a new series of works tentatively called, pure/white that express the colonial problematics of the Book of Mormon Lamanite-salvation narrative which erases and replaces indigenous histories with white ones. When Sherman Alexie said, "[i]n the great American Indian novel, when it is finally written, all the white people will be Indians and all the Indians will be ghosts," I don't think he'd read the Book of Mormon. White supremacy is the idea that people of Western European descent, who may have a light skin tone, are biologically, intellectually, and culturally superior to all other peoples. It was invented, along with whiteness, by white people to justify the fucked-up stuff we/they do. It is perpetuated in a multitude of ways contemporarily. Some of these perpetuations can found in the scriptures of the CJCLDS. For example, in Moses 7:8 & 22, "there was a blackness came upon all children of Canaan, that they were despised among all people...for the seed of Cain were black, and had not place among them." This scriptural ideology was used to bar black men from holding Priesthood power in the Church until 1978. 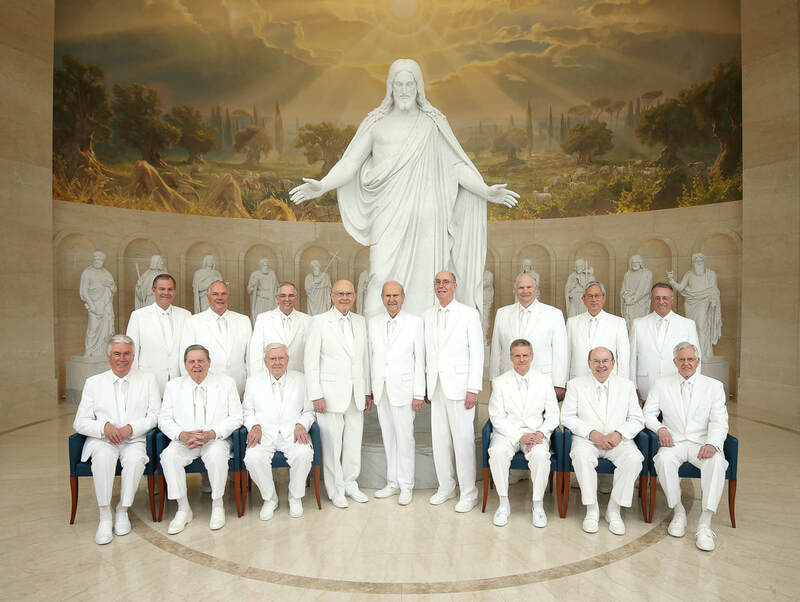 Similarly, in 2 Nephi 5:21 the Lamanites--who the CJCLDS teaches are the ancestors of the Indigenous peoples of this land--who "were white and exceedingly fair and delightsome" were cursed with "a skin of blackness" so that "they would not be enticing unto my people." Though the leaders of the Church speak against racism of any form, whiteness and its supremacy still linger. Every high-ranking leader of the church is/was White and the color, still equated with purity, is integral to many of their rituals. see also: baby and the bathwater, Book of Mormon, the Church, decolonization, ebb / flow, extermination / excommunication, kin(d), Lamanites, magic / ritual, myth, problematic, reify, remember / memory / memorial, there / their, "what is"
The current Prophet, First Presidency, and Quorum of the Twelve Apostles of the CJCLDS in the Rome, Italy Temple Visitor's Center.